Saint Brendon the Navigator, also known as Brendan the Bold and Brendan the Voyager, was the greatest traveler of the Irish Saints. He was both a monk and man of the sea who made many journeys, establishing monasteries wherever he landed, such as on Arran and other remote islands in the Hebrides off the west coast of Scotland. He voyaged to Brittany with Saint Malo, a Welsh monk, met with Saint Patrick and traveled extensively throughout the Celtic lands inspiring many followers and legends. The stories of the Voyage of Saint Brendan are part myth and part history, the Irish epic poem Sancti Brendani, the Voyage of St. Brendan, recounts his adventures. His legendary travels became entwined with the ancient tales of heroes such as Bran who journeyed to find the Land of Manannán—a mysterious Otherworld beneath the waves. Brendan is the archetypal sea hero, meeting monsters and strange sights upon his quest for the mysterious island of Hy-Brasil, who some say was the Americas. In AD 530 he climbed to the top of Sliabh Bhreandáin, Mount Brendan, a 3,200-foot mountain on the Dingle Peninsula in County Kerry on Ireland’s west coast, where there are still the ruins of a small beehive-shaped chapel. Here Brendan had a vision of Hy Brasil—the Isle of the Blessed—which is known by many names: Tir-na-nog, the Isle of the Apples, Isle of the Living, the Isle of Truth, of Joy, of Fair Women. Brendan set out on his mythic quest upon the sea with a company of intrepid monks to find the Land of Promise, Hy-Brasil. 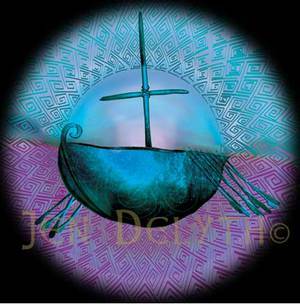 Sailing a simple curragh boat—a coracle of wood and leather—they set out into the unknown upon the great ocean, putting their faith in God, the elements, and their great instinct for navigation by the stars (the Celts navigated by the movements of the Pleiades).